There’s a new show on Animal Planet called Insane Pools: Off the Deep End. I think it’s pretty clear as to why they added that last part…because they are nuts (and I mean that in a good way!) That being said, that’s what makes the show better for me. Obviously, as the owners of a pool store we had to check it out and yes, the pools that they build on it are absolutely incredible but the family dynamic is my favorite part. It actually reminds me a bit of our very own Aubrey’s at Holly Hill. As a family owned and operated business for more than 50 years, we at Holly Hill can relate to working with your crazy family. 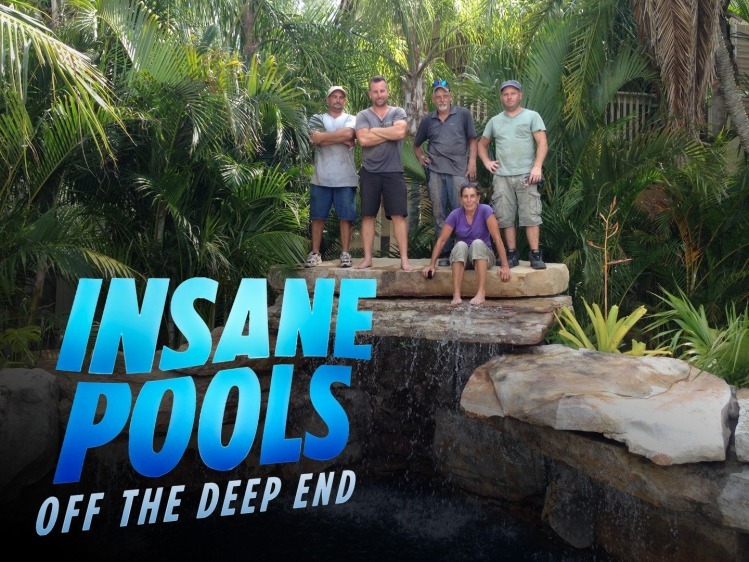 Lucas Lagoons (the company behind Insane Pools) started out as a landscaping business, which is coincidentally also how Holly Hill began. Al Aubrey started our business back in 1954 as a nursery and recreation center. Fun fact of the day: that’s actually how the name Holly Hill came about…we sold holly trees up on a hill! Enough about us though, back to the show. Lucas Congdon is the owner of Lucas Lagoons and his mother, Jane Werley AKA “Woman” is the lead stone mason. She is my favorite part of the show…Lucas, not so much. In my opinion, I don’t find him to be a very good host for a TV show because he seriously lacks that likability factor and his voice is incredibly monotone. Woman & the rest of the team, however, are quirky and fun. Everyone has a nickname: Matt “Sunshine” Schuler (native Staten Islander! ), John “Old Man” Messner and Chris “Crash” Warren. In this last week’s episode “In Hot Water”, Woman and Sunshine find a snake among the stones they were putting on the grotto/waterfall. This is where she won me over because she barely flinched when she saw it. I guess once you’ve done landscaping for a certain number of years, you build up a tolerance for the creepy-crawly. Lucas and Old Man have apparently not been at it long enough because they ran away like little girls…or more accurately in this case: like little boys. The finished product from Episode 4: In Hot Water. On to the piece de resistance: the pools. Their work really is impressive. They turn a backyard into your own personal paradise with their various lagoons, waterfalls, grottos, entertainment centers, swim-up bars, lighting fixtures, fire pits, etc. You name it, they seem to be able to incorporate it into your backyard. Lucas Lagoons is based out of Florida and although their work can cost a pretty penny, it’s worth it since people can use these pools year-round. They certainly know their stuff and produce high-quality work. If you want to check out the show, it’s on Fridays on Animal Planet at 9:00 (and re-runs quite frequently.) 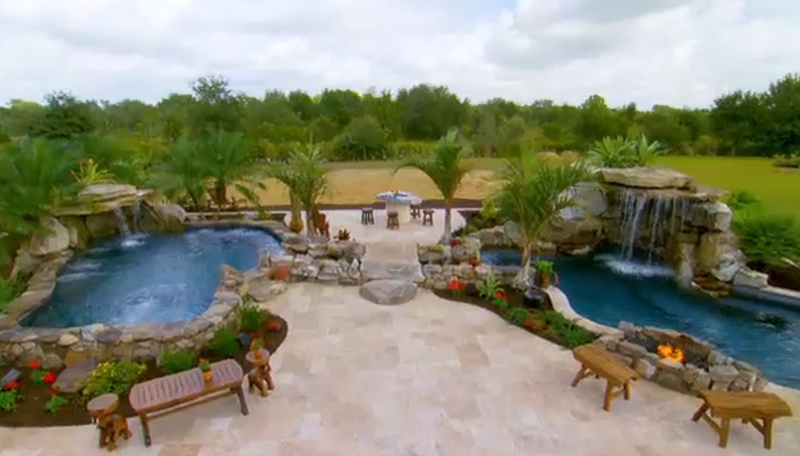 If you want to check out a real-life pool family in person, go to Holly Hill! ‹ Mineral Springs: A Spa in Your Backyard!